Product prices and availability are accurate as of 2019-04-17 14:33:23 EDT and are subject to change. Any price and availability information displayed on http://www.amazon.com/ at the time of purchase will apply to the purchase of this product. 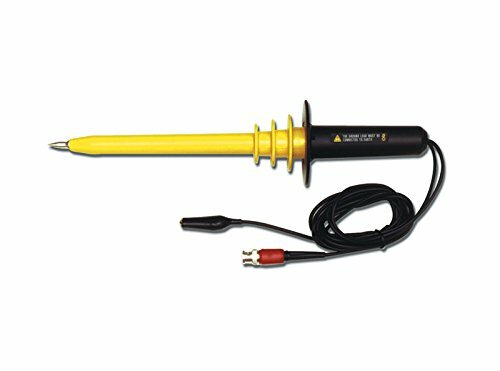 High voltage probe allows a standard oscilloscope to safely measure voltages up to 15 kV (DC + AC max) and frequencies up to 50 MHz. Type: Passive voltage. Bandwidth: 50 MHz. Attenuation: 1000x. Input impedance: 100 mohm. Input capacitance: 3 pF. Output impedance: 1 mohm. Rise time: 7 ns. Voltage maximum: 15kV / 10 kVdc/ac. Compensation: 5 - 50 pF. Accuracy: 0.7. Temperature coefficient: 200 ppm/degree C.